When you buy a new car, one of the first things the staff will give you is a comprehensive maintenance schedule. • The condition of belts and hoses. While they may seem insignificant, belts and hoses are what keep your car running. From circulating fluids to turning gears, the belts and hoses in your car do need to be changed from time to time. Luckily, the car care specialists at Rad Air Complete Car Care & Tire Centers know exactly what to look for and when to check each of these parts. They will look for wear and cracking that can cause a belt or hose failure and leave you without a car that functions at all. Belts and hoses are not generally expensive, but they can be a source of trouble for your car. Let us check them for you and keep you on the road. • Evaluate the condition and level of your fluids. Today’s complicated automobiles run on a myriad of different fluids. Everything from oils, transmission fluid, radiator fluid to brake fluid all need to be checked on a regular basis. And, it’s simply not enough to make sure that those fluids are up to the correct level in your car. Making sure that they are clean can impact your car’s performance. For instance, dirty transmission fluid can cause your gears to shift roughly and can impact the amount of miles you can go before an expensive service visit is needed. Dirty oil can damage your pistons and a lack of quality window washer fluid can impair your vision. Fluids are critical in the life of your car. • Check your lights. Cars have many sets of lights that are used for navigation and safety. Having just one of those lights not working correctly can cause insufficient lighting while driving at night. While your car is at the Fairlawn Rad Air Complete Car Care and Tire Centers location, our automotive specialists take the time to check to make sure that your car’s lights are all working correctly. From headlights to running lights and brake lights, we can replace the bulbs and even add halogen fixtures to give you the best visibility in the dark. As you can see, keeping up with your maintenance schedule doesn’t have to be difficult. In fact, if you let the professionals at the Fairlawn Rad Air Complete Car Care and Tire Centers take care of it for you, you’ll always know that your car will operate in an optimal way. 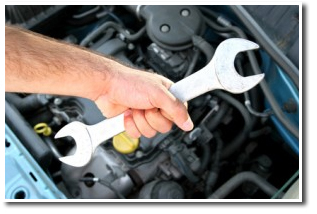 Call us today for more information on how we can schedule your car for regular maintenance.